3 number worksheets designed to make counting fun. Ideal to use in the classroom when learning how to count small sets of objects. Download and print the 3 worksheets. Use counters or small cubes to show a small set of objects. Demonstrate one-to-one correspondence when counting. 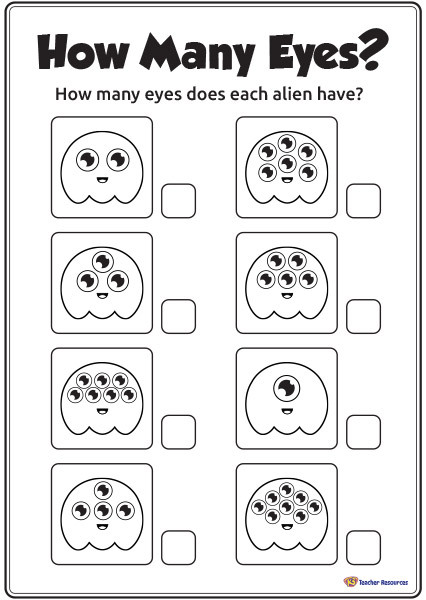 Explain to the children that the aliens have a different number of eyes, legs and spots. Encourage the children to shade in the eyes, legs and spots, or to use counters to assist with counting. There is printing all over this sheet why is that? Thanks for your help! This is happening on other sheets too. Its OK. I just downloaded it and everything went smoothly. I love all the resources. Thanks again! Regards from Bernie.